Bootcamp | How to Become a Forex and Futures Trader in 6 months? Enroll to our mentoring-based education program and get support from professional traders and educators. After the successful completion of our education program you will get an offer from our partner company. The Bootcamp is a six month comprehensive trading course that teaches about markets, risk management and technical trading, and pairs you with a proprietary trading firm upon completion. The course begins with your personal mentor who has passed their Series 3 and Series 34 examinations. The mentor guides you through a video course and webinar catalog through weekly one to one sessions. Upon finishing the course and webinars, you will begin a trading simulator wherein the mentor will oversee your performance. The Bootcamp is rounded off with a supervised trial in The Gauntlet™. Upon completion of The Gauntlet™ you will receive an offer to become a professional trader. Why is the bootcamp better than other trading education? The Bootcamp is a 360 degree course designed to get you trading in the shortest timeline possible. It features a full online video course, live mentoring via voice (or video) chat, simulated training, and our unique Gauntlet™ examination that upon completion will get you trading full-time for a proprietary trading firm. Do I need to have any background to participate? No prior background is required, the bootcamp is designed for newbie traders. What’s the schedule of the bootcamp? Mentors are Earn2Trade educational trainers who have passed their National Futures Association (NFA) Series 34 and Series 3 examinations. They will help you with any education topic that you are struggling with. You can book them for 30 minutes, or more if you need. If a candidate successfully completes The Gauntlet™ they will receive a guaranteed funding from Helios Trading Partners. The offer contains, but is not limited to three main points, including the funding amount, the maximum drawdown and the profit split. Funding falls within a $10-25,000.00 range, and all of the funds are available for the traders from day as available margin. 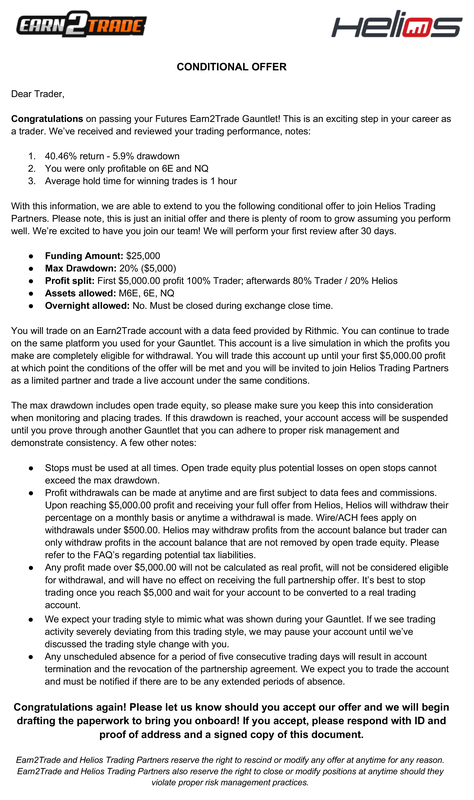 Here’s an example of a real offer sent to a successful candidate from Helios Trading Partners. It's a single payment of $2,499 for the full program. Occasionally, we offer discounts for our email subscribers. Enroll now to our trading evaluation tool, test yourself - and get an offer after successful completion!